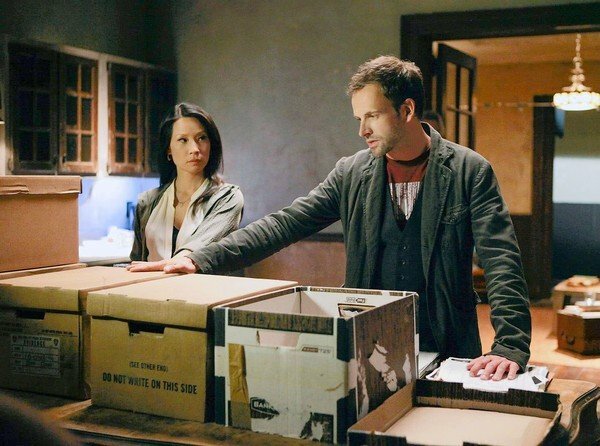 As a Sherlock Holmes fan and a big admirer of Sherlock with Benedict Cumberbatch, it’s hard not to view Elementary with Jonny Lee Miller and Lucy Liu skeptically. Well, they and all the production staff are adults and they must, one would think, know what they were getting into, so I make no apologies. I did tune in, right? What more could they ask? Alright so the show opens with a slick, choreographed attack and murder in progress, before it cuts to Joan Watson, former surgeon, now a babysitter for addicts, getting a call from the treatment center where her new client, Sherlock Holmes was staying. He’s escaped, one day early. Why bother if it’s just one day? Indeed. This Sherlock later explains he was bored. Seems that rehab and the group sessions would have been boring from the beginning. I guess the writers thought this was clever. I thought – hackneyed, obvious Hollywood trope. Joan and Sherlock get acquainted as she follows him around resuming his police consulting work in New York. Highly improbable, you say. Why would they let a consultant work on a case? Indeed. Well, Sherlock is acquainted with Captain Gregson (Aidan Quinn) who has no problem working with Sherlock. In fact, he’s pretty impressed by him. (These writers don’t understand the power of conflict.) One of the guys collecting evidence does balk at this Brit’s contribution, but he’s quickly silenced and ignored. Opportunity squandered. If the writers saw Sherlock, they’d learn something. So Joan lives with Holmes in his father’s most shoddy brownstone with wood floors and nice moulding. She’s an addiction companion or some such thing and predictably, they don’t take to each other. She’s got a secret reason for leaving medicine and you don’t have to be a genius to deduce that she killed a patient. Holmes does get more from her parking ticket, Google (yes, Google) and her demeanor. She supposedly accidentally killed a poor person who’s buried in a potter’s field. Joan’s rather cold and humdrum so I didn’t really care. The problem with Elementary, which for me ties with the poor Robert Downey Jr film, is that while they throw in some quirks and references to Arthur Conan Doyle‘s characters and stories, the series is in inept hands. I wasn’t wowed with Holmes’ ability to deduce because his conclusions seemed contrived or obvious. I stopped caring about the murder. Holmes discounts the husband as the killer and they interview an acquaintance. The scene was ho hum, but the duo learn that the victim had plastic surgery. We never hear the second suspect speak, another opportunity lost. Finding out through exposition, that he was a troubled rage-oholic guilty of attacking redheads, didn’t captivate as exposition usually doesn’t. By the time we find out who the killer was, I was tired of this Holmes who foolishly smashed the prime suspect’s car so he could get imprisoned. That wasn’t eccentric, it was foolish. Contrivance piled upon contrivance and the writers’ lack wit so the attempts at humor all failed me. Elementary follows the party-line of CBS shows’ formula to the letter learning nothing from Sherlock or the equally brilliant Luther. I tried to rewatch to make better notes for this post, but it’s ghastly and I really couldn’t. If you do stick with the series, my money’s on the writers forcing the duo into becoming a couple. Liu brings nothing to the role, neither does Quinn, though I grant both have little in the script to work with. Miller is miles behind Cumberbatch, but since I saw him and liked him in Frankenstein, I think with better writers, he could be a decent, different kind of Holmes. It’s doubtful we’ll see that. Elementary reminded me why I watch so few programs on CBS. They’re all slick and flashy with anemic stories. No one at CBS seems to understand that the ante has been upped by the BBC. Tonight I’ll watch my Sherlock DVDs or maybe an Outnumbered. This entry was posted in musing, opinion, Review, television and tagged Arthur Conan Doyle, Benedict Cumberbatch, CBS, detective, disappointment, Jonny Lee Miller, mystery, police drama, procedural, Sherlock, Sherlock Holmes, thumbs down by smkelly8. Bookmark the permalink.